Agriculture is the main occupation in India. Two-third of India’s population is dependent on agriculture either directly or indirectly. Agricultural income is exempt under the Income Tax Act. But, is this provision holds good even if you have other sources of income? Let’s discuss.. In this post let us understand – What is an Agricultural Land? What is considered as Agricultural Income? What are the scenarios where Agricultural income is exempted from income tax? What are the scenarios where income from Agriculture is considered for calculating your tax liability? How to calculate income tax on Agricultural income? What are the tax implications on sale of agriculture land? How to save capital gain taxes on sale of Agricultural land? What is an Agricultural land? Any land used for agricultural purpose shall be treated as agricultural land. It can be situated in rural area or urban area. What is considered as Agricultural Income? The land should be used for agricultural purposes only. Income derived from agricultural land through cultivation or agriculture. Any rent or revenue received from tenant or sub-tenants of agricultural land. Income received from sale of agricultural produce. Income derived from saplings or seedlings grown in a nursery. The farmhouse is occupied by the cultivator or receiver of rent from land. The farmhouse is located in the immediate vicinity (near) of the agricultural land. The farmhouse is used as storehouse or out-house or dwelling house. But, if the income from farmhouse is through letting out for residential purposes or for any business purposes, such income is not an agricultural income. Is Agricultural Income exempted from Income Tax? If your agricultural income is less than Rs 5,000 in a Financial Year, it is tax free. If agriculture is your only source of income, such income is tax exempt. If you have agricultural income and also have other income from salary/business , and the total income excluding agricultural income is less than basic income exemption (i.e., more than Rs 2.5 Lakh for AY 2016-17) limit then there will be no tax liability. How to calculate Income Tax on Agriculture Income? What if your agricultural income is more than Rs 5,000 and if you also have income from salary / business / profession which is above the basic exemption limit? In this scenario, your agricultural income has to be added (included) to the total income while calculating the tax liability for the given Financial Year (FY). Step 1 – Add Agricultural income and other sources of income. Step 2 – Compute income tax (A) on the above aggregate income as per the applicable income tax rates. Step 3 – Add Agricultural income to the applicable basic exemption limit. Step 4 – Compute income tax (B) on the above aggregate income at the income tax rates prescribed. Step 5 – Income tax liability is A – B.
Let’s understand this with a simple example. Mr Reddy (35 years) is having Salary income of Rs 3,00,000 and net agricultural income of Rs 90,000/-. What is the income tax liability of Mr Reddy for AY 2016-17. In the above scenario, the agricultural income is above Rs 5,000 and the other income is above the basic exemption limit. So, we need to include agricultural income to total income when computing tax liability. Add Agricultural income and other sources of income. Aggregate income = Rs 3,00,000 + Rs 90,000 = Rs 3,90,000. Add Agricultural income to the applicable basic exemption limit. Aggregate income = Rs 90,000 + Rs 2.5 Lakh = Rs 3,40,000. Compute income tax (B) on the above aggregate income as per the applicable income tax rates. Income tax @ 10% on Rs 3.4 Lakh is Rs 9,000. Mr Reddy’s income tax liability is Rs 14,000 – Rs 9,000 = Rs 5,000. So, it is clear that even though agricultural income is exempted under IT act, in actual practice it is not the case. Also, if you are in say 20% tax bracket, addition of agricultural income may take you to 30% tax slab rate. So, agricultural income is considered for determining the applicable income tax slab rate. Land is a capital asset. Capital asset typically refers to anything that you own for personal or investment purposes. It includes all kinds of property; movable or immovable, tangible or intangible, fixed or circulating. So is Agricultural land a Capital Asset? Do you need to pay income tax on sale of your agricultural land? If your agricultural land is in rural area, such land is not treated as Capital asset and hence no capital gain taxes are levied. Agricultural land in Rural Area India is not considered a capital asset. Therefore any gains from its sale are not taxable under the head Capital Gains. 2 kms from local limit of municipality or cantonment board and If the population of the municipality/cantonment board is more than 10,000 but not more than 1 lakh. 8 kms from local limit of municipality or cantonment board and If the population of the municipality/cantonment board is more than 10 lakh. 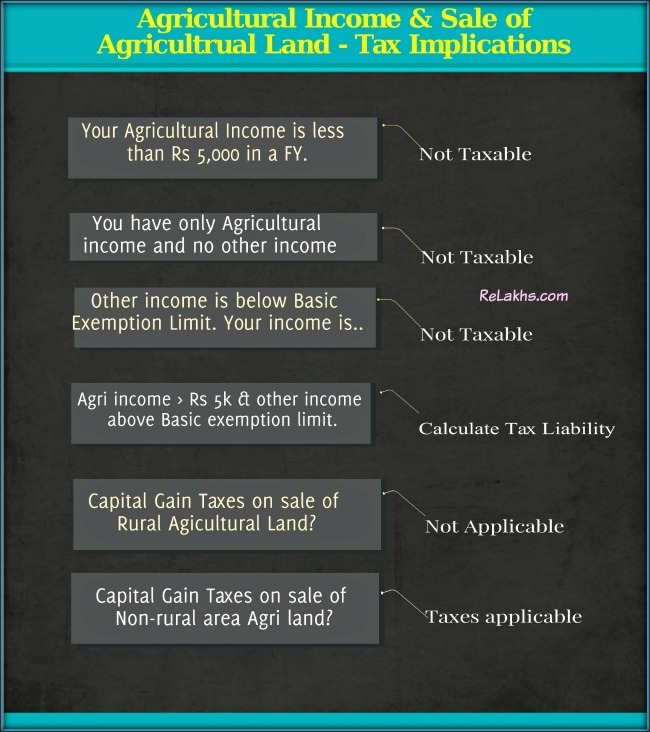 So, if your agricultural land falls in Urban Area (non-rural area) then Capital Gain Tax is applicable. If Agricultural Land is held for 36 months or less 24 months or less (w.e.f FY 2017-18) then that Asset is treated as Short Term Capital Asset. You, as an investor will make either Short Term Capital Gain (STCG) or Short Term Capital Loss (STCL) on that investment. Short term capital gains on Agricultural land will be taxed as per applicable income tax slab rate. How do I save Capital Gains tax on sale of Urban Agricultural Land? If you sell an agricultural land and make capital gains, you can re-invest such gains in acquiring another agricultural land. You have to buy another agricultural land within 2 years. The new agricultural land that is acquired should be held by you for atleast 3 years from the date of purchase. If you sell land and make long-term capital gains, you can re-invest entire sale proceeds to purchase a residential house within 1 year before or 2 years after from the date of sale of land or you should construct the residential house within 3 years from the date of sale. You should not own more than one residential house on the date of transfer of land. If you sell agricultural land and make long-term capital gains, you can re-invest Capital Gain amount to purchase NHAI or REC bonds within 6 months from the date of transfer. The maximum allowed investment is Rs 50 Lakh. The bonds should not be sold/transferred for 3 years. The capital gains can also be deposited in Capital Gains Account Scheme of any designated banks. The Central Government can’t impose or levy tax on agricultural income. The exemption clause is mentioned under Section 10 (1) of the Income Tax Act of India. However, state governments can impose tax on Agricultural income. I have agricultural income as the only source of income, should I file income tax return? – It is not required to file IT returns if agriculture is your only source of income. But filing Income Tax Return has its own advantage so you may consider filing your taxes. Is 1% TDS on sale of agricultural land is applicable? – 1% TDS is not applicable on sale of Agricultural land. I have Agricultural income of more than Rs 5,000, which ITR form should I file? – You can consider filing in ITR 2 form. Can I carry forward capital losses? – Yes, capital losses from agricultural operations can be carried forward and set off with agricultural income of next eight assessment years. I am a sub-tenant or tenant of agricultural land, is my agricultural income tax-free? – Kindly note that ownership of land is not essential. All tillers of land are considered as agriculturalists and enjoy exemption from tax. Income from trees that have been cut and sold as timber is not considered as an agricultural income since there is no active involvement in operations like cultivation and soil treatment. Dairy / poultry Farming, income from supply of water for irrigation purpose, income from sale of earth for brick-making, rental income from Farmhouse given for non-agricultural purposes etc., are not considered as an agricultural income. Is foreign agricultural income tax exempted? – Foreign agricultural income is not entitled for exemption and it is chargeable to tax under the head ‘income from other sources’. I have tried my best to provide all tax related matters of Agricultural income & on sale of Agricultural land in a simple and easy to understand manner. Hope this is useful! Do you believe that agricultural income should not be exempted from income tax? Is agricultural income one of the root causes of generation of domestic black-money? Kindly share your views and comments. Thanks! Hi Srikanth, i have bought 20 cent agriculture land with amount of 15Laks and now i converted that land into layout and i paid the conversion charges and land comes under major panchayati limit and i will be planing to sell 2 plots out of 3 plots, each plot cost as 15laks, so is it taxable on 2 plots cost (30 Laks) . Please suggest. If your holding period is less than 2 years then you have to taxes on Short term capital gains (if any). Kindly read : How to save Capital Gains Tax on Sale of Land / House Property? One of my friend sold his agriculture land in rural area for more than government value and he is planning to invest entire amount in the fixed deposit of the bank. He sold his property for 80 lakhs (market value) but government price was 20 lakhs. 1. Does he need to pay tax for entire 80 lakhs? Or it is exempted as it is rural agriculture land? 2. After investing in FD’s, does he need to file income tax return for 80 lakhs. And also does he need to file every year. 3. If he need to file income tax return then what link he need to follow to do this. 4. Does he need to pay any other taxes while fixed depositing in bank. 5. What precautions need to be taken before investing entire amount in fixed deposits, if any. He is not willing to work in bpos due to serious health issues. 2 – The interest income on FDs is a taxable income. So, if his income is above the basic exemption limit then he has to file his ITR. * Do I need to file my Income Tax Return? 3 – I did not get your query..
4 & 5 – Is the Sale Deed done for Rs 80 lakhs or Rs 20 lakhs? The sale deed consideration done according to government value i.e., for 20 lakhs. Related to 3rd question, I got answer in your first answer. I am seeking your advise on 4 and 5 questions. Please help on this. The sale deed consideration was done for 20lakhs as per government value. If the Registered value is just Rs 20 lakhs then he may have tough time to deposit the remaining amount ie Rs 60 lakh, as it is not a white money. Even if he deposits, he may get a tax notice from the IT dept inquiring about the Source of these funds.. Thank you Sri, I will inform my friend the same. I am a salaried Govt. Employee and have taxable income. I inherited 3 bighas of Rural Agricultural Land(Falling under Exempt Income category on it’s sale as per land use, character and distance and population from a Municipality etc.) after the decease of my father. Now I intend to sale the land for Rs. 6 Lacs. Is the sale proceeds taxable in my hand? It is tax-exempt in your hands. Are the proceeds used to buy this house property from the sale of Agri land? If so, yes, its eligible. Kindly refer to the points given in the article. I have bought agriculture land in rural area at cost Rs. 500000 in july 2018, now i m selling this land in January 2019 at consideration at Rs. 1200000..so i have to pay any tax?? Agricultural land in a rural area in India it is not considered a Capital Asset, and therefore no capital gains are applicable on its sale. Dear Sreekanth, if agriculture land is sold with teak and sandalwood trees in the land, would the taxation be any different for the seller? Thank you. There are no clear rules reg. this. However, Income from trees that have been cut and sold as timber (or sandalwood/teak) may not considered as an agricultural income since there is no active involvement in operations like cultivation and soil treatment. You may kindly consult a CA. Thank you very much Sreekanth. The article you pointed to helps. Would appreciate if you can throw some light on my below Queries. Thanks in advance for your support. i) Is there any upper cap on exempting the Tax for the Amount received on the sale of Agricultural Land in rural area. 2)Which documents evidences the land as Agricultural category. 3)Can the registration amount/Land cost be more than the actual Government rate in this case. Can I have the registration amount as 30 Lakhs, while the actual Govt value(circle rate) of the land is 10 Lakhs. 5)If the said land is not considered as capital gain, I believe the whole 30 Lakh is non taxable. Please advise. 2 – The classification of the land can be ascertained from Setwar/RSR, Pahani/Adangal, IB register, Pattadar Pass Book and Title Deed. Can get the details from the concerned Village Revenue office / Panchayat office. Mutation details should be checked in ‘land revenue records’ as it (mutation) is mandatory for Agricultural lands. 3 – Yes, it can be..
4 – Kindly inquire at local Panchayat office. Plz refer to the pointers given in the above article as well (Definition of Rural area). 5 – Yes, if it is an agri land. Any idea if land under G.O 111 will be excluded from this tax exemption? I do not have an idea about GO 111 (which can be State specific). You may kindly consult a civil lawyer.. I worked in India for 10 years. Out of my savings I bought a piece of AGRICULTURAL LAND while being a resident. Subsequently I moved abroad for a job. I am an NRI but file my income tax return regularly because I have some source of income in India. The agricultural land (in RURAL AREA) has been in my name for 5 years. Now I wish to dispose it off. After indexation there may be some gain. Please advise if I have to pay any income tax on capital gain as an NRI which I need not have paid as a resident. Agricultural Land in rural area is not a capital asset and no capital gains shall arise on transfer of such land.Such exemption is covered under section 10(37) of the income tax act, 1961. Hence there will no capital gains on this sale. Moreover, this is exempt irrespective of the residential status of the owner. Thus, even if you become NRI, the sale would be exempt from taxability. A certificate under 197 can be availed from the Income tax Department for Not deducting Tax. I am selling my agricultural land in rural area (Nilgiris), i am spending 50 % of the amount to buy an apartment in city (coimbatore) the balance amount of 50 % to be deposited as FD mode for safe monthly/quarterly payout mode of interest, this interest they (Bankers) deduct 10 %. I am filing income tax hereafter. Is there any other govt rules i have to face in future ? Sir, I am going to sell my Agricultural land (having one unused old stone house) at Nilgiris in a rural area. The amount i am getting from the sale to be used as 50 % in safe Bank FD, the balance 50 % to buy an apartment at Coimbatore city. Since I heard there is no tax on sale of agri land, is there any other tax i have to face ? I would be very grateful to you, if you could answer this, because i am little bit worried. (50 % buying property and balance 50 % deposit in FD, the quarterly payout mode, the interest i am getting as 10 % taxable) Beyond this i need your suggestion. Till date, i am having pan card but no IT filing since i am doing agriculture. Kindly note that the sale proceeds realized from the sale of Agri land is not subject to taxes. You can buy a Flat. The interest income earned on FD is a taxable income. You have to file your Income Tax Return. Sir, I’m planning to buy a rural agricultural land, & deal is undergoing below circle rate. It is clear from your blog that capital gain will NOT attract to seller being rural agricultural land. Can you please give guidance on buyer’s perspective for below circle rate registration, will the difference be taken as income from other sources or it will not attract being rural agricultural land ?? If the property is a rural agri land, it will not attract any taxes.. I am a teacher my own agricultural land is in rural areas. I want to sale it now. However, you can just file your Income tax return disclosing this exempted income, so that you can avoid any tax notices. I am purchasing an agriculture land at a price lower (~5 lacs) than the guideline price, in a village which is 15 KM away from the nearest municipal corporation. Kindly advice if I have to pay income tax on the difference amount under Income from Other Source. Dear Mr Singh.. Income tax (if any) is payable only when you sell any asset and not while buying..
Are you referring to Stamp duty and registration fees? If so, then you need to pay them as per the guideline values only though your ‘Consideration’ is less.. I am a salaried class employee. I received compensation from Government (District Collector for National High Way project) for my agricultural land situated in my native village. I would like to know which ITR form to use for filing my returns for AY2017-18 and showing this Agri land compensation from Govt. Please let me know which ITR form i have to use and also please clarify under which head this income falls (which is completely tax exempted). As this compensation is tax-exempt, you can disclose it under ‘Exempt income’ section of an ITR. Which ITR form? 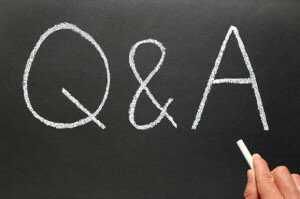 – It depends on your sources of income. Suggest you to check with a CA too. Kindly read : Which ITR form to file FY 2016-17? My Friend Sold a Rural Agricultural Land (Agriculture land as per sec 2(14) it is not capital asset) to NRI and received money Rs.40,00,000/- (40 Lakhs) trough Bank Account from NRI Account. Please tell me am I need to show it as Capital gain or agricultural income. For you, it is a tax-exempt transaction.Agricultural land in Rural Area India is not considered a capital asset. Therefore any gains from its sale are not taxable under the head Capital Gains. Some where I saw (In RBI website) that NRI cannot buy Indian agriculture land. If NRI wants to buy Indian agricultural Land They have take prior permission from RBI. In the above situation NRI did not taken any such permission. So, what will be the tax or what we have to do. Kindly help. Under the exchange control law, an NRI is permitted to purchase immovable property in India other than agricultural land or plantation property. Suggest you to kindly take advice from a lawyer / Chartered Accountant who deals with NRI taxation matters. hi sir , i have agriculture land and i want to sale it and want to use that money in other investment like buying a flat and car or non-agriculture land ..so is my other investment are taxable…. If your agricultural land falls in Urban Area (non-rural area) then Capital Gain Tax is applicable. Dear Kishan ..Kindly go through above article. If there is a sale of RURAL AGRICULTURE LAND, which is outside the purview of capital assets u/s 2(14) of the act. How the sale proceeds is to be treated under income tax? it may be noted that it is not an agri. income as per expl 1 to S. 2(1A). neither any specific exemption provided u/s 10. Also, S. 2(24) i.e. Definition of income do not cover such issues. whether it is a capital receipt or any specific treatment available in the act? My wife sold a piece of agricultural land in a village area costing 55 lac in 2014-15. The part of money was received in cash and part by cheque which was deposited in bank. Now Income tax department wants clarification. This sale was agriculture land in rural area and sold to many people which they may use for residence also. Dear Mr Madhwal ..Kindly take help of a CA and respond to the Compliance Notice. sir, please clarify me . Dear prince ..Kindly consult a CA. Excellent blog with such a clear cut definition! !….thanks you sir its really helpful for an IT illiterate like me and simple to understand! !Greatly appreciate your work!!! Thank you for the appreciation! keep visiting relakhs! Dear sir i am going to sell my agriulture land situated in my village (Rular area) and getting up to Rs. 46 lakh . is this ammount come under tax. and now planning to purchase new agriculter land. Dear santosh..No, it is tax-exempt. I have not seen such a clear and informative article on this matter before this . Kudos !! Though it is clear from given answers but i also have one query . Pls help . I bought an agriculture land 4 years back in a village in Lucknow UP . Approx distance of land is 4 KM from municipal limit and population of Lucknow is more than 10 lac. Given this is long term capital tax is applicable on me if i sell land now ? Dear Amit..I believe that LTCG taxes are applicable in this case. However, you may kindly consult a local Chartered Accountant on this and get the confirmation. I would like to know the backing for foreign agricultural income being taxed as ‘income from other sources’ in India. Thank you. My suggestion would be to advise them to get PAN cards and you may then finalize the deal. TDS is applicable if the sale value is more than Rs 50 Lakh. Sir, My mother 82yrs housewife sold her*Rural Agricultural Land for Rs. 1800000/- to 5 persons through 5 different sale deeds. Prior to the sale the land continued to be used for paddy cultivation for time immemorial and it is also recorded as agricultural land. But after the sale the buyers filled the land and plans to build home on it without formally/legally converting it into a *Bastu land. My query is whether their such activities will deprive my mother of income tax exemption? Till the date of transfer, your mother is eligible to get applicable tax provisions/exemptions. Land is in purely rural area and agricultural.. The gains are tax exempt. Rural Agricultural Land does not constitute a Capital Asset, therefore Capital Gains Tax is not levied on the sale of Rural Agricultural Land. Thank you so much for the information and timely reply.? I sold agriculture land in 2008-9 and bought a Residential “PLOT” in my area within a year of the total amount of selling price , can i get get capital gain exemption under 54B or 54F ? Does residential plot comes under agriculture or it comes under residential house or it is not included in any exemption ? Dear shiv ..2008-09?? Now, you can not claim any tax exemptions.. Residential plot is not an agri land. If the address mentioned in PAN card differs then residential address, How to know whether Income tax department sent any notice or not. I am asking this question because in many rural areas and villages CA assistance or shop brokers file for PAN card and give their shop address and handover the PAN card to individuals after receiving the PAN Card. In this scenario address mentioned in the PAN card is shop broker address and not the residential address of the PAN holder. In this case how to know whether there is any kind of query to the PAN holder from Income tax department. Dear Kishore..Kindly refer to our conversation on Linkedin. I am very thankful for the useful article provided by You. My name is kishore. My parents have agriculture land. Till 2 years back the area was under Rural limits. Recently government announced the area as Urban. My mother posses the agriculture land from more than 30 Years. According census 2011 the zone is under Rural limits. This year my mother sold just few cents of the agriculture land and she received around 8 laks, do we have to follow census 2011 definition as Rural or current year definition as Urban while calculation capital gain income, my question is whether this amount is exempted from capital gain tax or according to this year declaration as urban limit do i have to pay the Capital gain tax. If it is in Urban limits as per current FY and if the land is sold in current FY, then capital gain taxes can be applicable. Do consult a CA who is from your location. Purchased a rural agriculture land(fulfills above requirements) in 2011 for 12lks. Sold in Jan 2016 for 30lks. Am salaried and regular with returns since 10yrs. 1. As this is rural agri land, no cap gains tax for me? But I read in net, if I don’t use any of above ur exemption options, it is capital gain, please clarify. 2. In case of registration amounts during both cases less than above mentioned prices,how is gain calculated a. Delta of registered B. Delta of transactions. 3.Sale was in jan16, I haven’t yet declared. Should I need to declare even if I opt ur suggested exemption options? 4.if at all it is capital gain. And I couldn’t able to use ur options for exemption, then after 2 yrs should I declare n pay tax? Thanks for the informative article and advance thanks for look. 1 – I believe that as Rural Agricultural Land does not constitute a Capital Asset, therefore Capital Gains Tax is not levied on the sale of Rural Agricultural Land. You may kindly share the Link(s)..
3 – You may declare it as Exempted income. Thanks for reply. Few more clarifications pl. 1. What should be done when sale price is higher than circle price in case of agriculture land I.e. no capital gain! may be need to declare as income? Dear SKRS..You can disclose it as Exempt income in ITR. Hi I am salaried , I have taken 16.5 laks loan from HDFC and my salary account is CITI . I have savings of 5 laks from my salary . But I have taken all the money and given for home construction . Now I am facing problem with 500 and 1000 notes . 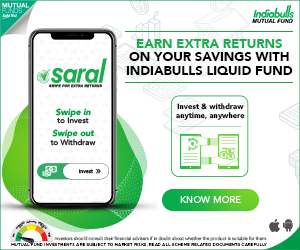 If I deposit this money back to account , Should I need to pay tax for it ? Please suggest . If the source of such money is your salary income and/or loan, kindly do not worry to deposit back to your account. Do keep the copies of loan statements & bank statements with you, for future reference. This was not disclosed in my balance sheet. Now I need to sell this agricultural land in 2016 Dec.expecting price Rs 5 cr.in cheque. Is there ant tax implications? Dear Rakesh..Kindly consult a CA. They shall reply only after notice comes. If you do not have any other Source of Income, then any gains on this transaction can be exempted from taxes. i sold my agriculture land in may 2013 but still have that amount(50 lakhs) in cash .is this amount under tax free benefit. Dear Ajay…Is agriculture, your only source of income? Due to demonetization of old high denomination notes, you may find it difficult to exchange the amount. My father has registered 4 acres of agriculture land on my name which is now cultivating by my elder brother (my brother is farmer). In immovable property declaration i have shown this land but mentioned as zero income. Since am not getting any income from this land i have declared as zero income. But my brother is cultivating it and getting income. Am i doing correct thing by showing as zero income from this land in my immovable property declaration ? or i have to file tax for the income from this land (which is earning by my brother) ? You may show this as ‘agriculture land being given on lease’. Any rent or revenue received from tenant or sub-tenants of agricultural land, and is tax-exempt. I am salaried employee from central govt.. That is only my source of income. Advisable to show it as ‘agricultural land given it on rent’. In such a case, you have two incomes ie salary + agri income. Else, you have to calculate the income as given in the above section ‘How to calculate Income Tax on Agriculture Income?’. I’m planning to sell an agricultural land which is in the rural area in which fish is being cultured and the land was gifted by my father to me at the time of my marriage ie., nine years ago. I’ve no other income other than that (22,000 per year). I’m planning to take this money to go and settle out of the country. How much tax I need to pay if I sell the land? I believe that Rent received or Sale proceeds received from Agriculture lands which are used for Aquaculture/ Fisheries cannot be treated as agriculture income. In order to claim any income as agriculture income land must be used for agriculture operations. Aquaculture/fisheries in not agriculture operation. My father is planing to sell agriculture land (about 60 years old) situated in rural area and we would like to use the amount for my daughter MBBS education. My query is that shall i take all that money in my account and use for study purpose. The above said property is in the name of my father. Instead, he can gift the amount to his grand-daughter right? It can be a better option! Are you going to receive the sale proceeds as complete WHITE-MONEY? excellent analysis, can understand the time spent and commitment of you for this article. but general public are happy to vigorously use and simply give a big thanks. Sir, i purchased two residential plot one year ago,in which one is purchased by my name and another is from my proprietorship firm name,now i want to sell both the plot,according to collector guide line i have earn RS 50000 in each plot so what is the tax liabilities to me,is there any difference in tax in a plot purchase by name or by my firm name? Dear atul ..As it is a sole proprietorship, I believe that the tax provisions remain the same. My Mother received the notice from income tax department regarding transaction of 10 lac or more in the financial year 2012-2013 but this income is from her six acre agricultural land savings from more than 10 year .Kindly suggest what option I should opt for compliance module. Dear Rishant..You may respond to the notice stating that the mentioned income is ‘Agricultural income’. (assuming that she does not have income from any other sources). If possible, do consult a Chartered accountant. I have a farm house of total 7 Acres out of which I have done NA for 2 Acres. The balance 5Acres is agricultural land. The whole plot comes under village grampanchayat which is located around 18 kms from Palghar which has a Municipal Council and the population of Palghar is around 4.5 lakhs. What will be the effect of Capital gain tax on deal if I sell the property? Also what will be the effect of Capital gain tax on the NA portion? If your agricultural land is in rural area, such land is not treated as Capital asset and hence no capital gain taxes are levied. Agricultural land in Rural Area India is not considered a capital asset. Therefore any gains from its sale are not taxable under the head Capital Gains. Your land falls under the criteria of ‘rural agri land’. So, it is advisable for you to consult a CA and get advice. Thank you for your response. But what about the NA portion of 2 Acres in the same plot. Dear Shakeel..Taxes on gain can be applicable. Kindly take help of a CA. Sir,What is the Status of land registry if post dated cheque mentioned in the sale deed is bounced? Dear ankur ..Is n’t it a risky proposition to execute a Sale deed by accepting the Post Dated Cheques?? Suggest the concerned seller of the property to SUE the buyer immediately, for not meeting his obligation. If possible and aggreable to the buyer, you can get the DEED OF CANCELLATION done. Advisable to consult a civil lawyer. 1. my father is a farmer while I am in job. My father income from agriculture and irrigation of others paddy fields (own tube well) is around 1.5 lakh. But has no bill or invoice to claim the legality of income except “KHATAUNI” means documents of paddy field in his name. Can he show this income in his income tax return. 2. In 2013, me and my father has bought a land of 5 lakhs using in my mother name. We both my father from his agriculture saving and me from my salary saving, hadcontributed to the cost of land. Now income tax department asking my mother to submit the source of money. How can she show the source of money. 1 – If the only source of income is from Agriculture then there such income is tax-exempt. 2 – Did you receive any tax notice from the dept? Were there any transactions done in her name in bank accounts etc,? As per section 50C of the income-tax Act, while computing capital gain arising on transfer of property, if the actual sale consideration is lesser than the stamp duty value, then the stamp duty value is taken as the deemed selling price and capital gain will be computed accordingly. Within a period of two years from the date of transfer of old land the taxpayer should acquire another agricultural land, to claim tax exemption u/s 54B. If any village mentioned as a Rural village according to Census of India 2011, Does it comes as a rural village according to Income tax act also? If village controlled by gram panchayat (not municipality) and all villages of that panchayat has less than 5000 of population, Will it get any benefit of exemption in capital gain? Dear Ravi..Yes, it is as per last published Census data only. Dear Venkat ..All the points quoted by you are correct. But you could have still filed the ITR quoting the sale proceeds in Exempt income section as the amount is on higher side. If you have not received any notice from the IT dept you may just leave as it is. I am salaried employee and have agricultural land. How could I file tax returns if I have loss of income from Agricultural property. Is there a way to show the loss? Dear Kalaiyarasan..Losses from agricultural operations could be carried forward and set off with agricultural income of next eight assessment years. I planning to sell my residential Plot & want to buy Agricultural land, Can I exempt from Capital Gain ? Dear Shanmuga.. I believe that there is no such provision. I am under HUD family rural agricultrual land for sell . This will shared by 4 brothers and I am only working in private concern and pay the tax as per my salary. Now we are planning to sell the ancient property around 1 or 2 cr. All will be deposited in banks only for all my brothers. I have 2 child and elder brother also have 2 major children. Can I invest in Home or how much we much we have to pay? Bank manager informed for deposit no tax but interested will be taxed .. Yes, interest on the bank deposits is taxable. Thanks for your article on agriculture income. I am having 2 acres of land in my native village which came from my father through heredity. My father is expired 2 years back. Now I want to sell this property which is approximately 10 Lakhs worth. Previously I did not shown any agriculture income in my IT Returns. If is sell this shall I have to pay income tax on this. Kindly check out if it is in Rural or Urban area. Kindly go through the above article. Thank u Srikanth. Agriculture land is in rural area. If I get the amount by sale of this land, shall I show this as my asset income for the financial year and any income tax I have to pay for this amount. I want to make some investments with this like in Mutual Funds. How is the tax procedure. I am an NRI since 2014, how can I show this income in my IT Returns in India as I am not a tax person in foreign country. Which tax bracket will I fall in India as I am not having income in India for the last 2 years. If your income is more than Rs 50 Lakh then you have to show this under Assets & Liabilities section of your Income Tax Return. You may report this as Exempt Income in ITR. You can invest in MFs but when you sell then there can be tax liability. MF taxation rules for NRI. I have a piece of land in the lal dora category of delhi, Please can you tell me where can i obtain Loan against this property at the lowest rate? I have all the required documents needed to obtain a loan. Kindly contact any banker (HDFC/ICICI/SBI etc). JUst curious, if laws are so clear about Agriculture income tax than how big folks are making money out of it. We see TV report that in last couple of years lot on income showed as Agri income by biggies. What loop hole is being used here? Laws can be clear. But the issue is whether all the citizens abide to them or not. The main problem w.r.t agri income is, most of the deals are done in CASH. Dear megha..If agricultural income is the only source of income then it is tax-exempt. Can you please advise in case of Landlord who have a part farm house on agriculture land and earns income as a stay charges from the guests. So would the stay charges collected from guests on daily basis will be consider as agriculture income. Dear Kalpesh..I don’t think the said income can be considered as an Agricultural income. Thanks a lot for this information. Very nice article. Can I claim both Deduction Under Section 54B and 54F for sale of Agriculture land in Urban Area.(LTCG). Good question. I believe, YES (but 100% not sure).